I have been to many Churches where the entire congregations seem to think they have the Gift of speaking in tongues, many Churches even have it as part of their doctrine. I have heard it taught to people that if you have the Spirit, you will speak in tongues. Is this Truth? Let’s test it. 1Co 12:28 God has appointed in the church first of all apostles, second prophets, third teachers, then those who perform miracles, those who have gifts of healing, those who help others, administrators, and various kinds of tongues. 1Co 12:29 Not all are apostles, are they? Not all are prophets, are they? Not all are teachers, are they? Not all perform miracles, do they? 1Co 12:30 Not all have the gift of healing, do they? Not all speak in tongues, do they? Not all interpret, do they? 1Co 12:31 Keep on desiring the better gifts. And now I will show you the best way of all. 1Co 13:1 If I speak in the tongues of humans and angels but have no love, I have become a reverberating gong or a clashing cymbal. 1Co 13:2 If I have the gift of prophecy and can understand all secrets and every form of knowledge, and if I have absolute faith so as to move mountains but have no love, I am nothing. 1Co 13:3 Even if I give away all that I have and surrender my body so that I may boast but have no love, I get nothing out of it. 1Co 13:6 Is never glad with sin, But ALWAYS GLAD TO SIDE WITH TRUTH, Whene’er the truth should win. 1Co 13:7 She bears up under everything, Believes the best in all, There is no limit to her hope, And never will she fall. 1Co 14:2 For the person who speaks in a tongue does not speak to people but to God. Indeed, no one understands him, because he is speaking secrets in the Spirit. 1Co 14:3 But the person who prophesies speaks to people for their upbuilding, encouragement, and comfort. 1Co 14:4 The person who speaks in a tongue builds himself up, but the person who prophesies builds the church up. 1Co 14:5 Now I wish that all of you could speak in tongues, but especially that you could prophesy. The person who prophesies is more important than the person who speaks in a tongue, unless he interprets it so that the church may be built up. 1Co 14:6 Indeed, brothers, if I come to you speaking in tongues, what good will I be to you unless I speak to you in some revelation, knowledge, prophecy, or teaching? 1Co 14:7 In the same way, lifeless instruments like the flute or harp produce sounds. But if there’s no difference in the notes, how can a person tell what tune is being played? 1Co 14:8 For example, if a bugle doesn’t sound a clear call, who will get ready for battle? 1Co 14:9 In the same way, unless you speak an intelligible message with your tongue, how will anyone know what is being said? You’ll be talking into the air! 1Co 14:10 There are, I suppose, many different languages in the world, yet none of them is without meaning. 1Co 14:11 If I don’t know the meaning of the language, I will be a foreigner to the speaker and the speaker will be a foreigner to me. 1Co 14:12 In the same way, since you’re so desirous of spiritual gifts, you must keep on desiring them for the upbuilding of the church. 1Co 14:13 Therefore, the person who speaks in a tongue should pray for the ability to interpret it. 1Co 14:14 For if I pray in a tongue, my spirit prays but my mind is not productive. 1Co 14:15 What does this mean? I will pray with my spirit, but I will also pray with my mind. I will sing psalms with my spirit, but I will also sing psalms with my mind. 1Co 14:16 Otherwise, if you say a blessing with your spirit, how can an otherwise uneducated person say “Amen” to your thanksgiving, since he does not know what you’re saying? 1Co 14:17 It’s good for you to give thanks, but it does not build up the other person. 1Co 14:18 I thank God that I speak in tongues more than all of you. 1Co 14:19 But in church I would rather speak five words with my mind to instruct others than 10,000 words in a tongue. 1Co 14:20 Brothers, stop being children in your thinking. In evil be infants, but in thinking be adults. 1Co 14:21 In the law it is written, “Through people of strange tongues and through the mouths of foreigners I will speak to this people, but even then they will not listen to me,” declares the Lord. 1Co 14:22 Tongues, then, are meant to be a sign, not for believers, but for unbelievers, while prophecy is meant, not for unbelievers, but for believers. 1Co 14:23 Now if the whole church gathers in the same place and everyone is speaking in tongues, when uneducated people or unbelievers come in, they will say that you are out of your mind, won’t they? 1Co 14:24 But if everyone is prophesying, when an unbeliever or an uneducated person comes in he will be convicted by all and examined by all. 1Co 14:26 What, then, does this mean, brothers? When you gather, everyone has a psalm, teaching, revelation, tongue, or interpretation. Everything must be done for upbuilding. 1Co 14:27 If anyone speaks in a tongue, only two or three at the most should do so, one at a time, and somebody must interpret. 1Co 14:28 If an interpreter is not present, he should remain silent in the church and speak to himself and God. After showing people these verses, they usually say, “when the Holy Spirit moves, it just takes over, and I can’t control it, Halleluyah!” lol. Does this statement pass the Test of scripture? Gal 5:23 gentleness, and SELF-CONTROL. There is no law against such things. 1Jn 4:1 Dear friends, stop believing every spirit. Instead, test the spirits to see whether they are from God, because many false prophets have gone out into the world. 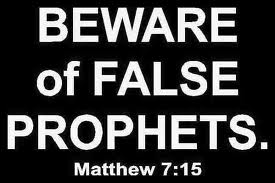 He says FALSE PROPHETS have gone into the World, not one, not a few, but MANY. Who are these False Prophets, and how can we know how to spot them? The Messiah as well as ALL, again, ALL the Prophets told us instructions on discerning the True Prophet from the real ones. False Prophets can give accurate prophecies, they can do miracles, they can show signs and wonders, they can do it ALL in the name of Messiah, but one single thing they can not and will not do is teach and practice the Laws of YHVH. Mat 7:22 Many will say to me in that day, Lord, Lord, have we not prophesiedIN THY NAME? and IN THY NAME have cast out devils? and IN THY NAME done many wonderful works? Mat 7:23 And then will I profess unto them,I NEVER KNEW YOU: depart from me, ye that work LAWLESSNESS. So right after he says beware of false prophets, and calls them “ravening wolves”, he goes right into saying that no matter how many prophecies, miracles, signs, wonders, or how many demons you cast out in His name, if you reject the Law of YHVH, YOU WILL NOT ENTER THE KINGDOM! So, can we get a witness to this? Is this a new concept? NO! Who are these “ravening wolves” and what do they teach? So we see here that the Messiah was speaking of the same False Prophets and “ravening wolves” that Ezekiel dealt with. They have many “fingerprints” we can look at to identify them easily. They do not teach the difference between clean and unclean(Kosher law). They do not observe nor teach the Sabbaths. They do not put a difference between Holy and Propfane. They intentionally violate the Laws of YHVH. Another thing is they are NOT SATANISTS nor are they OCCULTISTS, they are not Pagans, nor are they Muslims, they are ISRAELITES< people called by YHVH’s name. They are your leaders, Pastors, Deacons, Bishops, Priests, SUN-day school teachers, and whatever other title you want to exalt them with. It also says they do these things and teach these things to get DISHONEST GAIN. Example-They will tell you you do not have to obey all them burdensome rules in YHVH’s law, you can eat whatever you want, worship on whatever days you want, do as many Pagan customs as you want, but then tell you you MUST Tithe, some even go as far as to say that not tithing is robbing from YHVH. There is no commandment to tithe in the NT, it is ONLY COMMANDED IN THE LAW that they tell you is done away with. This is the definition of dishonest gain. They tell you anything you want to hear in order to make a buck, and they do not care if you are saved or not. 2Ti 4:3 For the time will come when people will not put up with healthy doctrine but with itching ears will surround themselves with teachers who cater to their own needs. Paul just said everything I said.”But Eric, my Pastor is such a nice and wonderfull man, he would not teach us error on purpose”. Let’s test this as well. Now with all that in context, let me shine a new light on the letter that Paul wrote to the Corinthians in His second warning to them. This is very humbling to me, because when I saw this all in context, I realized I was standing in Paul’s shoes. Amazing. 2Co 11:1 I wish you would put up with a little foolishness of mine. Yes, do put up with me! 2Co 11:2 I am jealous of you with God’s own jealousy, because I promised you in marriage to one husband, to present you as a pure virgin to Christ. 2Co 11:3 However, I am afraid that just as the serpent deceived Eve by its tricks, so your minds may somehow be lured away from sincere and pure devotion to Christ. 2Co 11:4 For if someone comes along and preaches another Jesus than the one we preached, or should you receive a different spirit from the one you received or a different gospel from the one you accepted, you are all too willing to listen. 2Co 11:6 Even though I may be untrained as an orator, I am not so in the field of knowledge. We have made this clear to all of you in every possible way. 2Co 11:7 Did I commit a sin when I humbled myself by proclaiming to you the gospel of God free of charge, so that you could be exalted? 2Co 11:8 I robbed other churches by accepting support from them in order to serve you. 2Co 11:9 When I was with you and needed something, I did not bother any of you, because our brothers who came from Macedonia supplied everything I needed. I kept myself from being a burden to you in any way, and I will continue to do so. 2Co 11:10 As surely as the truth of Christ is in me, my boasting will not be silenced in the regions of Achaia. 2Co 11:11 Why? Because I do not love you? God knows that I do! 2Co 11:12 But I will go on doing what I’m doing in order to deny an opportunity to those people who want an opportunity to be recognized as our equals in the work they are boasting about. 2Co 11:13 Such people are false apostles, dishonest workers who are masquerading as apostles of Christ. 2Co 11:14 And no wonder, since Satan himself masquerades as an angel of light. 2Co 11:15 So it is not surprising if his servants also masquerade as servants of righteousness. Their doom will match their deeds! Feminine of the same as G647; defection from truth (properly the state), (“apostasy”): – falling away, forsake. has already occurred, and the sheep are being chewed up by False Prophets on a massive scale. Many do not like confrontation, and only want to do the lovey dovey works of Yeshua, but there can be no peace when our Brothers and Sisters are being devoured by Satan’s Priesthood. This is a cry out call during the Hanukkah season in the same Zealous Spirirt of our Forefathers to raise up against the False Prophets who profane the House of YHVH, like Judah Maccabee, who faught with a small band of Brothers against the entire Greek Army, gaining victory after victory and regained the Temple and rededicated it to YHVH after it had been defiled by Antiochus. Like Elijah, who chased down and outran Chariots, slaying hundreds of men with His sword in one day. Like Jeremiah, who suffered great persecution from Zedekiah trying to turn the wrath of YHVH from Him. Like Daniel, who was thrown to the Lions because he stood in His Faith, or Stephen, who was stoned after being set up and Falsely accused of teaching lawlessness. Our Brothers and Sisters are being swallowed up, will you stand with me? My family has been discussing this topic lately.